French meets Japanese: cauliflower soup with kombu dashi. Counterpoint to salty 'cue: caramel cake. Unlike the wrapped, shelf-stable candies that sometimes attain the hardness of table-top hockey pucks, the caramel frosting was just as meltingly luscious as it looks. Alas, at dessert-time, a decision had to be made, and in hindsight the red velvet looked ever more tempting once out of reach. The same had been true for the strawberry cake — a regret since remedied (bottom photos). Burger (at dinner, $15.75). Tavern beverages not shown. The crust of ciabatta, and the crunch of cornichons within my Caprice de Lamazou ($12), contrasted splendidly with smoked salmon; lemon sauce, onion, and capers added their spritely touches, too. At this well-provisioned shop that proffers "cheeses and delicacies from around the world" (but particularly from around the Mediterranean), the possible sandwich permutations can seem overwhelming. Even after I settled on one of a score of named combos, I might have chosen a baguette rather than ciabatta or swapped in any number of dressings, garnishes, and other items. When in doubt, let your counterman guide the way. Below, from an earlier visit: the Lamoretti (currently $10.75), which sported roast beef, cheddar, cornichons, and, at my request, horseradish, on ciabatta. Burger, medium rare ($4.50): deconstructed, as brought to the table; assembled, and already oozing in anticipation; disappeared, except for juices and ketchup. (Updated with additional photos.) Khanom foy thong is prepared much like street-fair funnel cakes and South Asian jalebi, but with more-delicate results. "This is our Persian soup; we make it with 17 different vegetables. We top it with mint, crispy onion, garlic, and yogurt" (that is, kashk). The gal who runs Taste of Persia's outdoor pop-up repeats this litany tirelessly; despite the winter cold, customers just keep coming. Not far away, chef-owner Saeed Pourkay also serves his thick noodle soup, ash reshteh (small, $6), and three or four other dishes each day from the front corner of a Flatiron pizzeria. (At less-busy hours, you may be offered samples of the lot, commentary included.) The setting is unglamorous, but it does offer indoor seating and ready access to fountain soda. Previously: My Persian plate ($12) would look humdrum if not for the sumac powder and saffron water that decorate the basmati rice. That's too bad. Kabab diggi, the sauteed ground beef shown at top left, is quite good; fesenjan, below it — shredded duck in a pomegranate walnut sauce — is terrific, especially for the tartness of the pomegranate. The volunteer-staffed food stalls at this annual event, which also features arts and crafts and live performances, serve a number of dishes dear to the heart of the local Taiwanese community. Rarest, in New York, are Hakka dishes, the culinary heritage of a people who emigrated to Taiwan from Guangdong and surrounding regions of southern China. Shown above: "silver needle" rice noodle soup. The noodles, which had been extruded by hand the night before, were perplexingly short and fat but also pleasingly chewy. Below: "burning" grass jelly, whose namesake ingredient is melted and served hot rather than cut into pieces and served cold. The heated grass jelly was poured over mung and azuki beans and what looked like escapees from a fruit cup. In reality some of those sticky orbs may have been made from glutinous rice flour, while others may have employed taro or sweet potato. The different colors seemed to be only for looks; all had the same bland flavor and sticky texture. 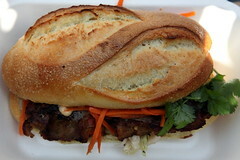 See these treats, and other menu items from multiple incarnations of the festival, in the slideshow. 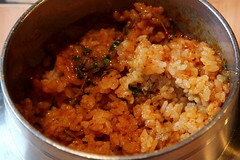 Kamameshi (kah-mah-May-she, or "kettle rice") is an analog of the Hong Kong-style claypot rice called bo zai fan. A distinction of this Japanese style is that it employs a metal pot for cooking and serving, but the similarity is more apparent: Good things are steamed with rice, which takes on their flavors. In the case of "five gold curry kamameshi" ($15), the principals are coconut curry, green onion, and minced chicken, which in the first photo have already been gently mixed with the rice. 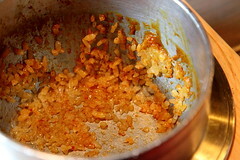 Also shown: the okoge, the enticing, desirable crunchy bits that adhere to the pot. True, the sandwiches owe some of their heft to the toasted baguette.